Ok, I guess that’s an obvious pun, but I spent a couple of hours sawing out flowers this morning. I was away last week visiting my parents with my son, and have been really looking forward to getting some shop time in this weekend. Unfortunately in addition to my son, I brought home a nasty flu virus, so things are moving a bit more slowly than I’d like. 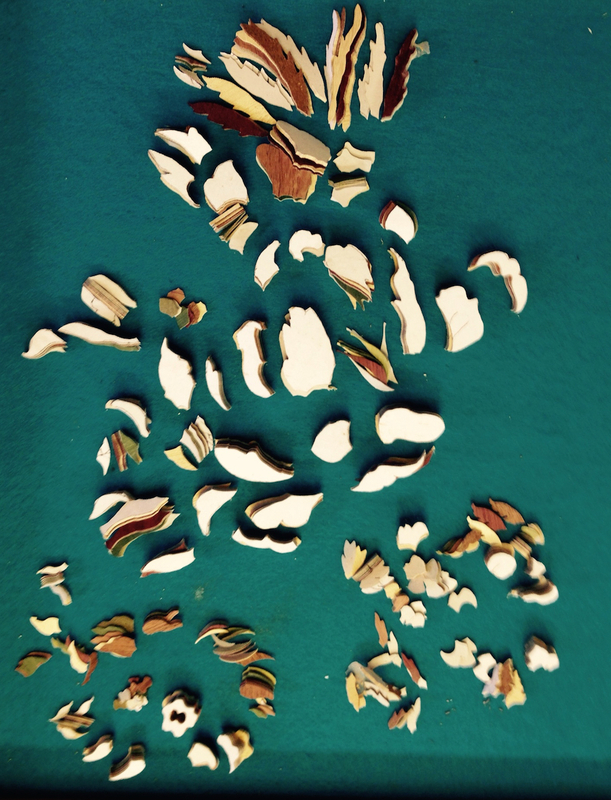 But this is also a lot of pieces to cut out. 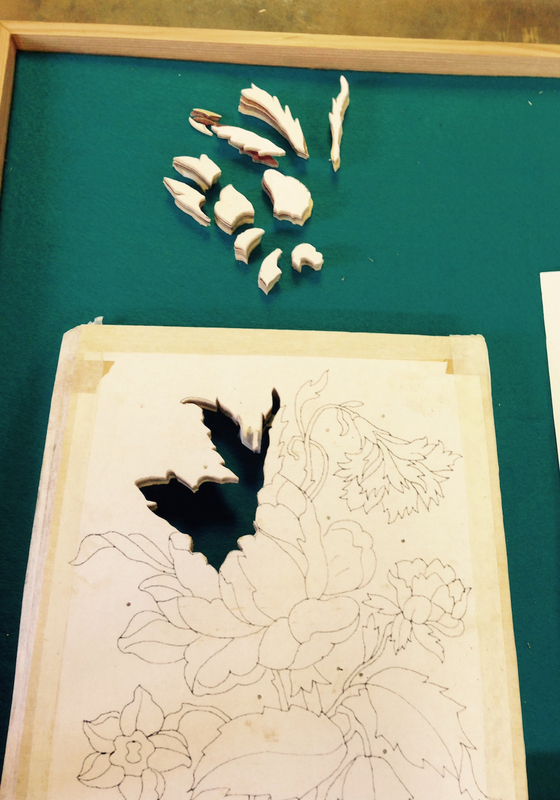 I have seven color layers of veneer — three greens for the leaves, three colors for the flowers and a background color. 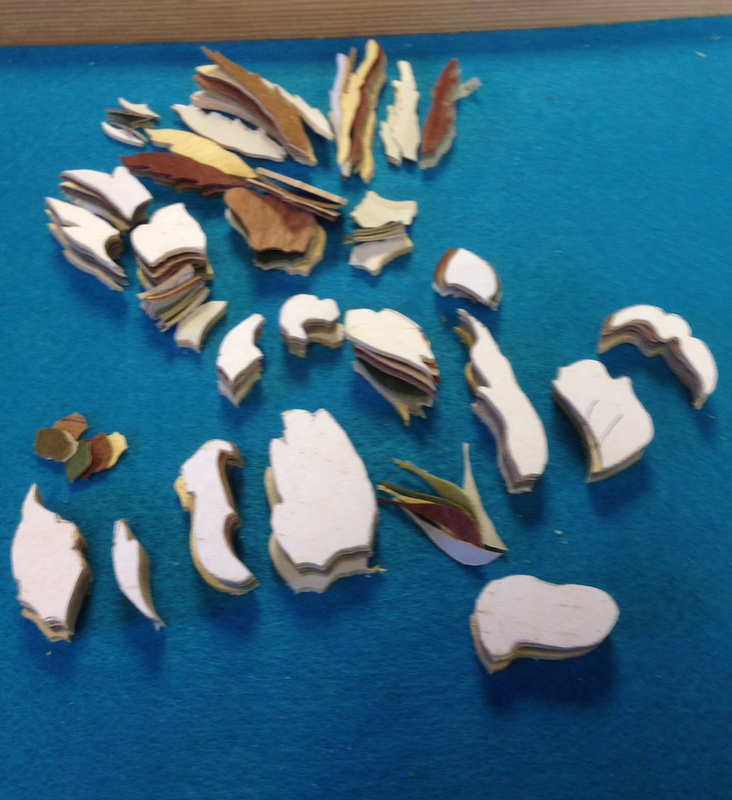 At a rough guess there are 100 separate shapes to cut out. Some are relatively large and easy to handle (why does that seem like cheating?) and some are smaller. A few of the stems and stem-leaves are fairly small, for me anyway. 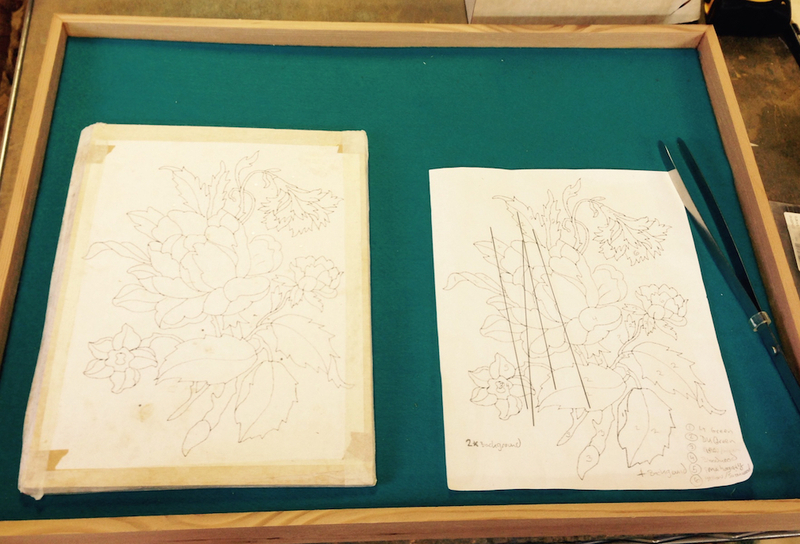 My new marquetry work tray all set up for the project. Tongs, extra blades, a (reversed) reference pattern, and the assembled veneer packet. I drilled a hole with a #65 bit and started in sawing out pieces. I’m guessing that this will take me 3 or 4 hours of sawing to get all the parts cut out. I don’t have the patience to sit and do it in one session, even if I wasn’t sick, so I’m interspersing other projects. I took a break and set up a kraft paper assembly board. I laid out an idea for a tool chest on some walnut — although I don’t think it’s going to work out. And for a change, instead of Lighting Hopkins I tried some Solomon Burke. Then I transitioned into my rock country mix with Iris DeMent, Lucinda Williams, John Prine and the Cowboy Junkies. I need a shop stereo, the headphones are too annoying with the Optivisor. More progress. Time for a new soundtrack. At this point I have all of the flowers and most of the larger leaves cut out, and it’s getting to be tricky to know how to progress. The stems connect that major cut out areas, as I start removing them the packet gets fragile and I could break off a section if I’m not super careful. This is roughly where I am as I write this post. I have a couple of large leaves to cut free, but I’m looking ahead at the interconnecting stems that bridge the cut-out areas. I think that’s going to be a little tricky. I’ve probably got one more hour of work at the chevy to finish cutting this packet. I’d like to finish the sawing today if I can. I’m finally feeling comfortable with the “coarse” 32 tpi blades. I can follow the lines 98% of the time, and I can make crisp turns. I need more practice before I’m ready to try the “piece-by-piece” method. I have to say, it’s a little daunting when I sit down to cut out a complex piece like this. I’m not stressing over it, but it’s a little tedious. Most of the other woodworking I do involves more varied work activities. I love the finished assembly, but it’s really time consuming to cut, sand shade, assembly and finish the panel. I’m only waiting for the last bits of hardware to finish the first Dutch Tool Chest, and I’m going to start another soon. I want one nice tool chest to take on the road the next time I take a woodworking class, but I’m on the fence between a DTC and a small traditional chest like the Traveling Anarchist’s Tool Chest or Sellers’ Joiner’s Tool Chest. You can expect it to have some marquetry design inside the lid. 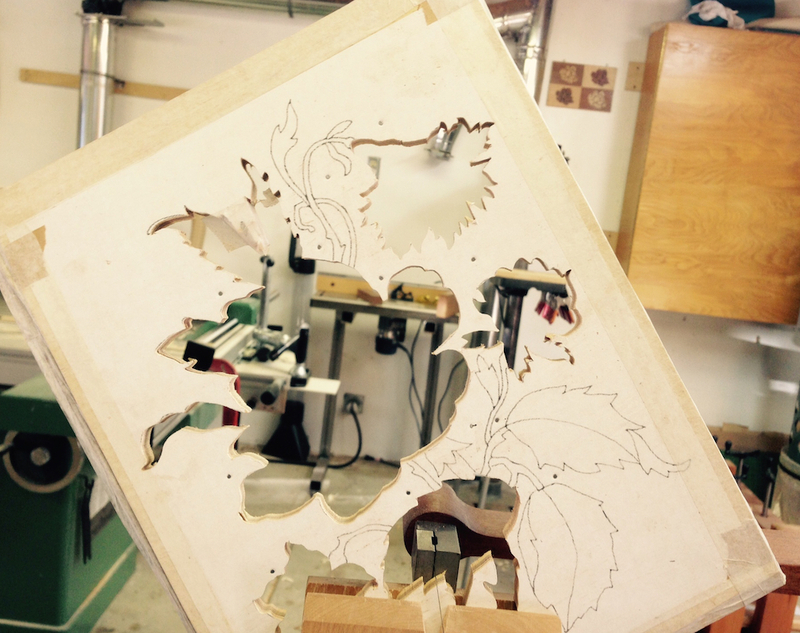 Marquetry design inside the tool chest lid, how cool is that? Awesome Joe. It looks great. I showed this to one of my friends, he asked, “Can’t he just use a scroll saw?” I then punched him. Joe, in a boullework i should not use veneernails but common scotchtape,its gonna be very beautiful,only pity for the holes(You can add some smole drips of hot glue between the sheets instead,after sawing place a hot kicthenknife between the sheets and they will seperate,use very liquid glue for easy seperating). I just bought a Porter Cable (small) boom box radio that you can plug your media player or use Bluetooth to broadcast Pandora music. Lightning Hopkins and others you haven’t heard of yet. PC did zing me when I got home and realized that the lithium 20v battery and charger don’t come with. Now it isn’t quite a bargain but it works great. It does have a 110 plug but i wanted to be cordless with the tunes. (when you go back to buy the battery and charger it’s cheaper to buy (another) drill that has 2 batteries and the charger included for less momey than they cost by themselves. Enough about tunes. The marquetry would make me nuts! I’m watching craigslist for a small stereo — a receiver and speakers — from someone who is upgrading. Just haven’t seen the right one yet. It is so elaborate and beautifully designed.